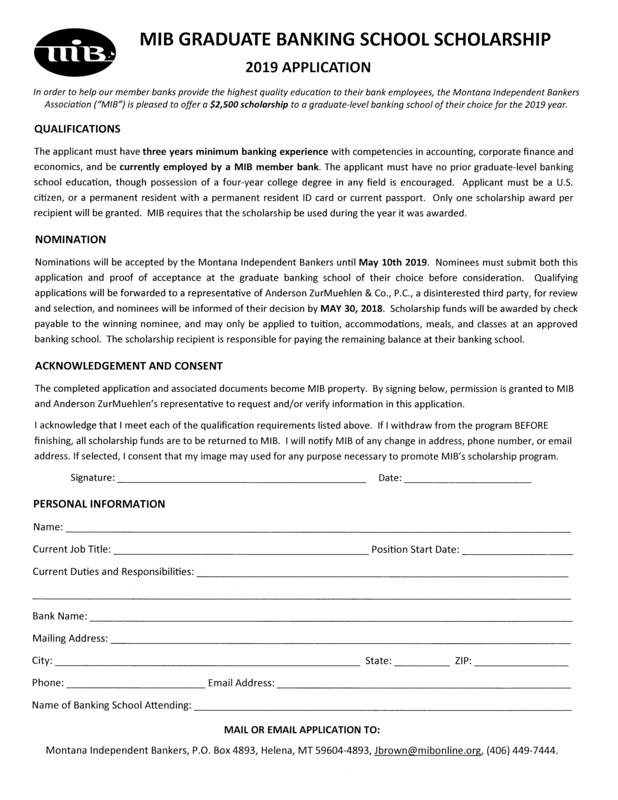 In order to assist our member banks in providing the highest quality education to their bank employees, the Montana Independent Bankers Association (“MIB”) is pleased to offer a $2,500 scholarship to a banking school of their choice for the 2019 year. The applicant must have 3 years minimum banking experience with competencies in accounting, corporate finance and economics, and be currently employed by a MIB member bank. Applicant must be a U.S. citizen, or a permanent resident with a permanent resident ID card or current passport. Only one scholarship award per recipient will be granted. MIB requires that the scholarship be used during the year it was awarded. Nominations will be accepted by the Montana Independent Bankers until COB April 30, 2019. Nominees must submit both this application and proof of acceptance at the banking school of their choice before consideration. Qualifying applications will be forwarded to a representative of Anderson ZurMuehlen & Co., P.C., a disinterested third party, for review and selection, and nominees will be informed of her decision by May 30, 2019. Scholarship funds will be awarded by check payable to the winning nominee, and may only be applied to tuition, accommodations, meals, and classes at an approved banking school. The scholarship recipient is responsible for paying the remaining balance at this banking school. Download and complete this application form and mail or email to MIB, along with proof of acceptance at a graduate-level banking school for the 2019 year, by COB April 30, 2019. Prominent mention in the MIB magazine and website. This award is based on the community banking values of good citizenship, community service, and sound banking skills. This award not only recognizes the impact that the candidate has in his or her business each day, but also the difference she or he makes by investing in their community. Eligible applicants must be under age 35, employed by a current MIB member bank for three consecutive years or more, and not have been the recipient of a prior MIB Outstanding Young Banker Award.